The Rewards and Recognition (R&R) Outsourcing market has emerged as one of the fastest growing markets in the HRO space clocking a growth rate of ~14% between 2016-2017. With employee engagement and experience becoming increasingly important for enterprises, the market is witnessing an increasing demand for R&R services from buyers of all sizes. This demand is bolstered by emerging market challenges such as changing workforce demographics and a rapidly evolving technology landscape. The market is dominated by specialist R&R providers who are now trying to expand their role from “just R&R program administrators” to that of strategic partners who can provide a gamut of services including consultative support (designing effective R&R programs), access to advanced technology solutions (such as advanced analytics, AI-based chatbots & decision support tools), and employee wellness & performance management services. This report examines the global Rewards and Recognition (R&R) outsourcing market and its service provider landscape. 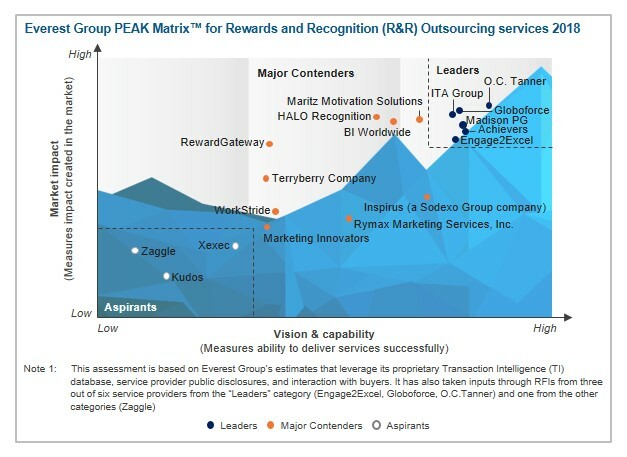 The R&R service providers are mapped on the Everest Group PEAK Matrix™, which is a composite index of a range of distinct metrics related to a provider’s vision & capability and market impact. It will assist key market stakeholders understand the current state of the Rewards and Recognition (R&R) outsourcing landscape. Based on the comprehensive Everest Group PEAK Matrix, 18 R&R service providers are segmented into Leaders, Major Contenders, and Aspirants. The report presents key findings on the performance of different service provider categories. Additionally, it provides insights into the strengths and areas of improvements of each service provider.